All hell broke loose in this week’s episode of Riverdale and literally no one was safe, except maybe Hiram Lodge. If you thought you knew what pure chaos and pandemonium looked like in Riverdale, let me tell you something: you have no idea what’s possible when old enemies resurface and secrets are uncovered in the midst of a town on the brink of utter collapse from self-annihilation. We pick up immediately after the shooting of Fangs Fogarty: we know he was shot but we don’t know who did it, only that Reggie Mantle had a gun and Archie tackled him. He is taken to the hospital alive and although it takes some aggressiveness to get him seen, he goes into surgery right away but Fangs doesn’t survive the night. In the midst of all of this is utter chaos as the Serpents want Reggie’s head on a stake and he’s on the run. I’d almost feel sorry for Reggie as he called Hiram for help as was dismissed, but Reggie is the dumbass who listened to Hiram in the first place and thought a gun would solve everything. However, multiple calls between Archie and Jughead get things settled down between the North and South side, not to mention Principal Weatherbee showing up with a baseball bat at school to break up the fight. So, all’s good, right? Wrong. The Serpents have taken refuge at the White Worm and Archie and some Northsiders have found Reggie (thanks Pop Tate!) and have taken refuge at Pops when a lovely gang of Ghoulies show up and begin smashing everything in sight. A well-aimed Molotov cocktail care of Archie from Pop’s roof plus Not-Sheriff-Anymore Keller, Fred Andrews, and FP Jones manage to run off the Ghoulies for now. So that was fun with tons of property damage. Meanwhile, in Betty’s little slice of hell, she gets a call from Cheryl saying the Black Hood just attacked her but she managed to get to her archery kit and wound him before he could cause her any harm. 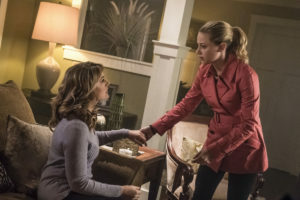 Betty spends the majority of the episode unsuccessfully trying to locate her father and, after a stop at the Register to hear Hermione Lodge make a statement about putting up a bounty of one million dollars for whoever brings in the Black Hood, Betty gets home to see bloody paper towels all over the kitchen counter. Betty gets a call from FP who saw her dad at the hospital but she arrives only to find a dead doctor in his hospital bed instead. She gets her final call from the Black Hood telling her if she doesn’t get home in ten minutes to finish what they started, he’s going to slit her mother’s throat. Betty arrives home and tries to get her mother to leave the house but Hal has insisted on a night of watching old family movies. What follows next is something you’d expect to see from Criminal Minds about the upbringing of a serial killer and the whole entire secret comes out. Yes, Hal is the Black Hood who has been killing sinners. Yes, it’s a family thing, a tradition even. Hal admits to having the darkness and the murders of Miss Grundy, the Sugarman, Midge, and shooting Fred Andrews. However, he was not responsible for the shooting at the mayoral debate. Betty’s mother being who she is, decides to taunt Hal about his ineptitude, the fact that he should kill himself since he’s a sinner, too (you know, the affair with Penelope Blossom? ), and to twist the knife in further, says that FP is twice the man Hal is in every way. Thankfully Betty was there with a fireplace shovel to hit her father as he was strangling her mother. 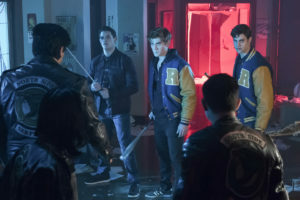 Hal is taken away in cuffs as Archie arrives to tell Betty the Black Hood just attacked his father again, which means there is a copycat lurking out there somewhere since Hal was home confessing when Fred was attacked. But don’t worry; Fred is fine thanks to a bulletproof vest he was still wearing from breaking up the Ghoulies. Initially, Veronica isn’t having as tough a night as everyone else and she is the one who manages to find out who shot Fangs. While driving by she spotted Midge’s mother, Mrs. Klump, wandering the streets looking slightly dazed and confessed that she “may have killed that boy.” Well, that’s one mystery solved. The real trouble for Veronica starts when Small Fry, Papa Poutine’s not so small son, shows up seeking to avenge his father’s death. Hermione and Veronica run to the study (since Small Fry already killed André) to barricade themselves in. Thankfully Hermione knows where the gun is and after four shots to the torso, the giant finally falls. Needless to say, both are pretty shaken up about the whole thing and are not at all happy with Hiram for putting them in the situation to begin with. Also, since Hiram is friendly with the sheriff, he gets to spin the story of the dead body in the house and no one will know real reason there were two dead bodies in the house. Jughead has been through a lot this evening: He’s been to the hospital for Fangs, corralled the Serpents back to the White Worm, has been trying to keep the peace and now he gets a call from Penny Peabody who has Toni Topaz as a hostage. Jughead meets Penny (now running the Ghoulies) and – with Archery Cheryl for backup – Jughead gets Toni back but with a warning: back off the Southside or there will be a war at Pickens Park come daybreak. The issue was later called to a vote at the White Worm and the Serpents want war, even if they are outnumbered. 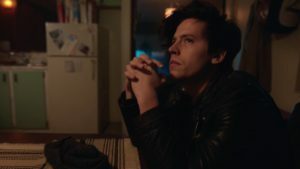 Jughead, however, doesn’t and comes to realize that Hiram is behind all the events of the evening. Jughead calls him with a counteroffer to avoid the war: Jughead will be a sacrificial lamb to the Ghoulies. He makes a farewell call to Betty and proceeds to get a beat down from 30 Ghoulies after his one punch. The next thing we know, FP is walking out of the forest with a bloody, tattoo-free and lifeless looking Jughead in his arms. Veronica found the “October Surprise” in her dad’s desk complete with an article and pictures of the affair between Fred and Hermione. Veronica is beyond furious about the whole thing for many reasons. Hermione does seem to be losing her nerve after having to kill a man in her house. Hopefully, she gets out from under her husband and his mess. We need more Archery Cheryl! 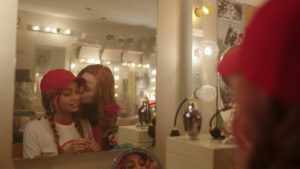 Betty’s “Riverdale must do better. We must do better.” speech is what triggered her father to start the killing of sinners. When Hal said, “I want everyone to understand when they find us.” I wonder if he had planned a murder/suicide. What’s with the clown paint, lead Ghoulie? I guess Hiram will stop at nothing to get the Southside, even if it means paying the Ghoulies and letting drugs run rampant. Hal’s father killed the Conways and used Hal to get the surviving child, Joseph (Mr. Svenson), to say he saw someone else do it. That’s twisted. Great Grand Pappy Cooper killed Great Grand Pappy Blossom and took the Cooper name to create a new identity. The Conways knew the secret so they had to die. During his beat down Penny told Jughead that the war was still going to happen, so he got into that mess for nothing. This episode shows how much communication matters in life. Everyone take note because this is how you avoid a massive war.